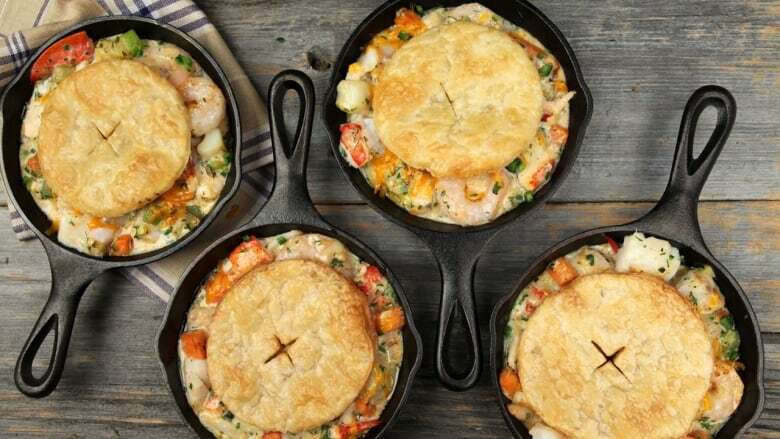 Even the biggest seafood haters will love this pie! It’s creamy, hearty and perfect for cold night in. Filling can be made the day ahead and chilled, or eaten on its own as a delicious stew. Preheat oven to 425F. In a large cast iron skillet, heat the canola oil over medium heat. Add the leeks, celery and carrot and saute until softened, 5-7 minutes. Push the vegetables to the edge of the pan. Melt the butter in the centre and sprinkle over the flour and cayenne pepper. Whisk together to form a roux and cook for 2 minutes. Pour in the milk and whisk. Add the seafood and season to taste. Bring the filling up to a simmer. While the filling is heating, lay out the puff pastry on a floured surface. Using a bowl as a guide, cut a puff pastry circle about 1" smaller than the size of your cast iron pan. Remove pan from heat, stir in cooked potatoes and herbs, sprinkle with minced jalapeno and grated cheese, and top with puff pasty circle. Cut two vents in the pastry and brush with heavy cream. Bake until puff pastry is golden and cooked through, 20-25 minutes. Serve warm with a green salad.